NASA's traffic control system for interplanetary spacecraft is bracing for a flurry of activity in deep space. June 6, 2001 -- On April 28, 2001, a weak radio signal reached Earth from beyond the orbit of Pluto. It was NASA's Pioneer 10 spacecraft, struggling to communicate with ground controllers, its message riding on a radio signal that registered just a billionth of a trillionth of a watt. How do you listen to a transmission that couldn't make a lightbulb glow in a billion years? It's all in a day's work for NASA's extraordinary Deep Space Network (DSN). Right: A 70-meter antenna at the Deep Space Network Goldstone complex in California. The DSN is a global system for communicating with interplanetary spacecraft. The largest and most sensitive scientific telecommunications system in the world, it also performs radio and radar astronomy observations for the exploration of the solar system and the universe. "Communicating with missions in deep space is difficult," said Joseph Statman, Manager of the Deep Space Mission System Engineering Office at NASA's Jet Propulsion Laboratory (JPL). "It requires extremely large antennas, huge transmitters and very sensitive receivers." The DSN consists of three clusters of antennas spaced approximately 120 degrees apart around the world: at Goldstone, in California's Mojave Desert; near Madrid, Spain; and near Canberra, Australia. "The strategy here is, no matter where the spacecraft is, you're always in contact with it," explained Statman. Each complex is situated in semi-mountainous, bowl-shaped terrain to shield against radio frequency interference. Above: DSN locations in Spain, Australia, and California are approximately 120 degrees apart in longitude, which enables continuous observation and suitable overlap for transferring the spacecraft radio link from one complex to the next. The centerpiece of every DSN facility is an enormous 70-meter diameter antenna (230-foot) capable of tracking spacecraft more than 16 billion kilometers (10 billion miles) from Earth. Arrayed around that dish is an assortment of 34-meter, 26-meter, and 11-meter antennas. The 26-meter antennas feature a double-axis astronomical mount that allows them to point low on the horizon to pick up fast-moving, Earth-orbiting satellites as soon as they come into view. These can track at up to three degrees per second. DSN antennas communicate with far-flung spacecraft at radio frequencies of 2.2 GHz, 8.4 GHz, and 32 GHz. For comparison, the lowest frequency, 2.2 GHz, is about the same as radio waves that cook food inside household microwave ovens. All of the antennas communicate directly with the Deep Space Operations Center at JPL in Pasadena, CA. The center staff directs operations, transmits commands and oversees the quality of spacecraft telemetry and navigation data delivered to network users. NASA recently announced it's upgrading the DSN to handle a surge in interplanetary traffic. Left: NASA's Stardust spacecraft will be one of many distant missions competing for Deep Space Network time in 2003. "We're getting ready for a crunch period beginning in November 2003," said Rich Miller, head of planning and commitments at JPL. That's when the U.S., Europe and Japan all will have missions arriving at Mars. These include NASA's 2003 Mars Exploration Rovers, the ESA Mars Express Mission, and the Japanese Nozomi spacecraft. 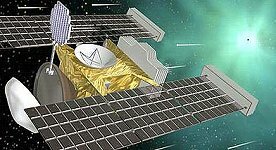 At the same time Stardust and Deep Space 1 will be encountering comets and a third comet mission named "CONTOUR" will launch. And, of course, other ongoing missions will have continuing communications needs. "[These new] missions all happen to lie in the same part of the sky," said Statman, who described the area where the spacecraft will cluster as a slice of the sky with Mars in the middle. "We need to track them but we don't have enough antennas." Madrid will receive a new 34-meter antenna that will increase available spacecraft-tracking time by about 105 hours per week when Mars is in view. The Madrid complex's current capacity is 315 hours. "The tracking capacity is proportional to the number of antennas at each location," said Statman. "At the moment, Madrid is the most crucial site for an upgrade simply because we need more tracking time there." Goldstone already supports as many as 420 hours per week of deep space communication, a figure that will balloon to 525 hours when an existing antenna comes online in 2003. "Both the Japanese and the Europeans have tracking antennas in Australia," says Statman, so they can help with the communications load at that longitude. As part of the upgrade, older hardware and software systems will be phased out and replaced with ones that are more reliable and, in some cases, automated. Also, Madrid and Canberra will receive processing equipment that will allow operators to combine signals from multiple on-site antennas, increasing their sensitivity to distant transmissions. Goldstone can already do that. Every bit of extra sensitivity is welcome, says Statman. The total signal power arriving at a network antenna from a spacecraft transmitting from the outer solar system is 20 million times weaker than the power level from a modern digital watch battery! Teasing out faint signals from space probes isn't all the DSN does -- it's a powerful scientific instrument in its own right. The Goldstone 70-meter antenna, for example, doubles as a powerful solar system radar. It captures radar images of planets and passing asteroids, searches for water on the Moon, and helps pick landing sites on Mars. Together, the three DSN facilities along with other antennas around the world form a powerful Very Long Baseline Interferometer that can peer into the hearts of quasars, measure Earth's continental drift -- even test general relativity. Not bad for a bit of moonlighting! NASA's Deep Space Network truly is an international treasure, and it's about to become even better. 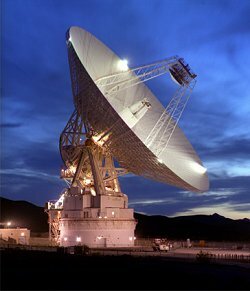 For more information about DSN and its ongoing upgrades, please visit the Deep Space Network home page from JPL. Editor's Note: The Deep Space Network is funded and managed by NASA's Space Operations Management Office and Code S.
Web Links The Deep Space Network -- Home page NASA's Jet Propulsion Laboratory.